Carrot cake is one of our nation’s favourite cakes, apparently. Who would have thought something as healthy as carrots would appeal to such an extent? As I was dreaming autumn thoughts the other day, I had a sudden urge to try making carrot cake in flapjack form. It worked beautifully and these carrot cake flapjacks are just the best. Having set blueberries as the ingredient for this month’s We Should Cocoa, I’ve not managed to get my act together to bake what I had planned and I don’t think I’m going to before the deadline. 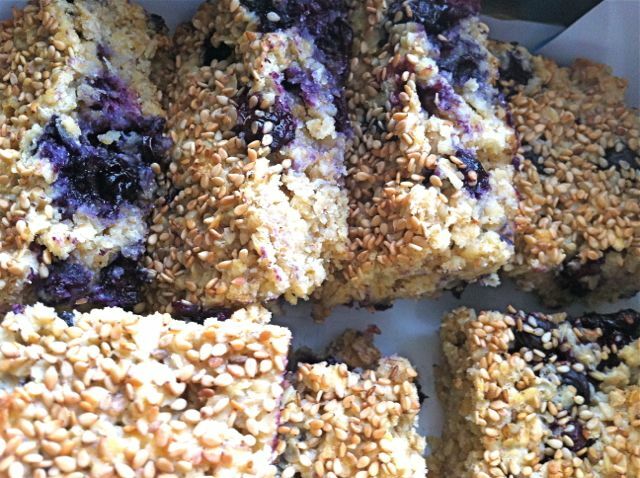 However, a couple of years ago, I made these rather scrumptious blueberry and white chocolate flapjacks with some local blueberries, but for some reason never got around to posting about them. Here goes. As I was buying some bananas in the Co-op the other day, I noticed a pack of reduced price raspberries. I couldn’t resist. They were fine, but not quite enticing enough to eat as they were; they looked as though they needed to be used quickly. The fastest thing I know how to bake are flapjacks. 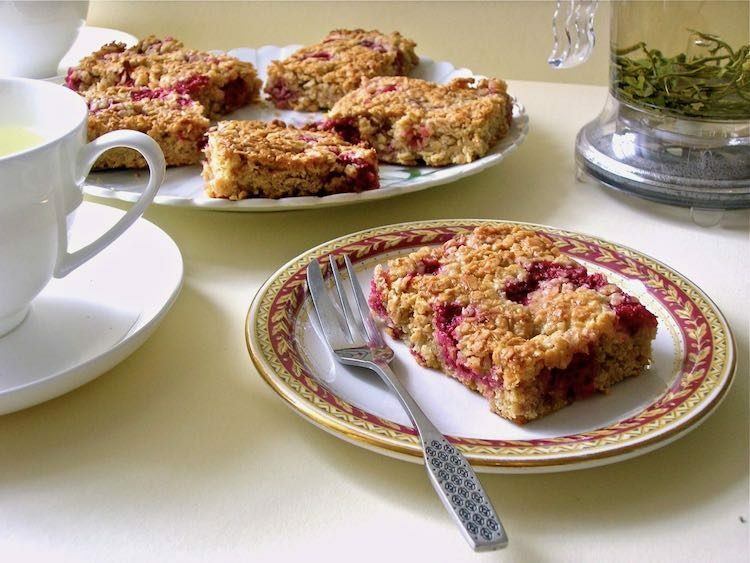 In next to no time, I had a plate of warm raspberry and white chocolate flapjacks. Not long back from my trip to London and I’m off on another jaunt. This time I’m in Birmingham, sampling hot chocolate at the Christmas Market. Hot on the heels of this I’m going to stay with friends at my old stomping grounds in Leamington Spa. Flapjacks are a firm favourite of one of my hosts, so I thought I’d crack open a jar of last year’s homemade mincemeat and make him some chocolate mincemeat flapjacks – with a little kick. Leftovers seem to be the name of the game at the moment, with all the post Easter talk of ways of using up leftover chocolate. A couple of my recipes even got a mention in The Guardian. When I heard that this month’s Tea Time Treats was all about preserves, my brain somewhat guiltily turned to my stash of ancient jam. I make jam and have all sorts of fanciful ideas of throwing tea parties with grand cakes and scones, jam and cream. I do manage it occasionally, but rarely often enough to use up all the jam I make. 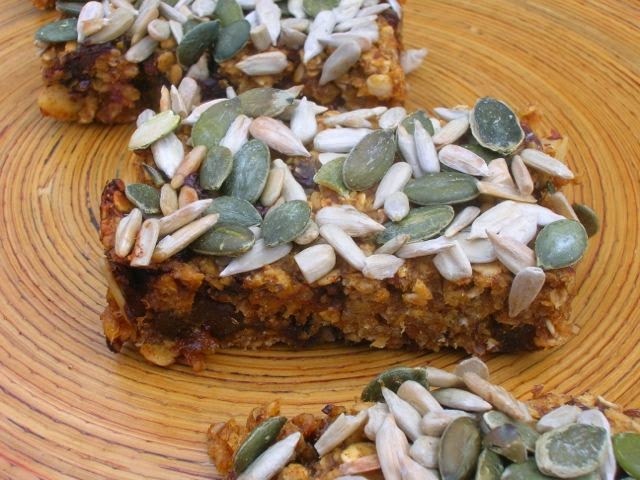 Breakfast bars, snack bars, energy bars, call them what you will, these are just perfect for grabbing on the run, lunchbox material or sitting down with a cuppa. They are not only healthy but very tasty too. Packed full of energy boosting ingredients, these are virtually fat free and contain no dairy and minimal refined sugar. I used 70% dark chocolate, so there is a trace of sugar to be found, but you could easily use 100% chocolate for a completely sugar free version. Our celebratory trip to the Isles of Scilly this year, taken as our annual holiday, was utterly and completely glorious. Good walking, a bit of pampering and relaxation and delicious food in a quiet and beautiful location was what we were after and that is exactly what we got. The weather wasn’t too bad either. We only got three days of drizzle and mists and the rest of our week was near unbroken sunshine – not bad for this part of the world. We’ve been promising ourselves a trip to the Scilly Isles for years. I went to Bryher on a school camping trip when I was twelve and fell in love with the island then. I’d never been back and CT had never been at all despite all the botanical delights to be seen there. If it hadn’t been for Issy of Clotted Cream Diaries, I very much doubt we’d have made it this year either. Issy is Scillonian born and this year left her life here on the mainland to go home and set up an eco B&B which just happened to be on the island of Bryher. What with significant birthdays to celebrate and total exhaustion to alleviate, the call was just too strong. The Scilly Isles are made up of many islands, but only five of them are inhabited. Bryher is the smallest, but also the least developed with a particularly wild moorland quality, which made me feel right at home. We managed to visit all five islands whilst we were there and although Bryher remains my favourite, we were both taken with St Martin’s and St Agnes as well. One of the great delights was the virtual absence of motorised road traffic – bliss. We found the Scilly Isles in general to be very laid back and the people friendly – it was like stepping back in time and reminded us of our six months spent in New Zealand back in the 90s. Samson Hill Cottage is the last dwelling on the sheltered side of the island, so it was wonderfully quiet and secluded. Overlooking Tresco, we had a stunning view of the sometimes turquoise waters. On the day of our arrival, we were welcomed with a huge cream tea, with local clotted cream and jam and a pile of scones made by Issy, which we scoffed in the garden. As well as a fabulous breakfast with more menu choices than I’ve ever seen and using as much local produce as possible, we also enjoyed three evening meals. Each afternoon when we returned from our various outings, we’d find a piece of delicious homemade cake in our room. Goodness me, Issy’s double chocolate brownies were something else, in fact they were so good, I forgot to take a picture. In addition to the B&B, Issy and her husband Gareth also do two pizza nights a week from their wood fired pizza oven in the garden. Despite our feeling of repleteness, we couldn’t resist a pizza on our last evening and we are so glad we indulged. Oh, did I mention the fudge? We had a packet of locally made fudge (which just happened to be made by Issy’s mum) left in our room on a couple of occasions too. Couldn’t resist this cheeseboard with four Cornish cheeses – who needs dessert? As well as the chocolate brownies and pain au chocolat, we did have a couple of other chocolate indulgences whilst visiting the other islands. Sadly the chocolates, handmade on St Agnes, were not available on our visit, but luckily the island had chocolate ice-cream, made with Jersey and Ayrshire clotted cream. It was the best ice-cream I’ve had in a very long time – thick, creamy and rich. It worked really well with the, ahem, “bonus” scoop of rose geranium – a complete revelation. So with all that food, lunch and sometimes dinner was hardly a priority for us. 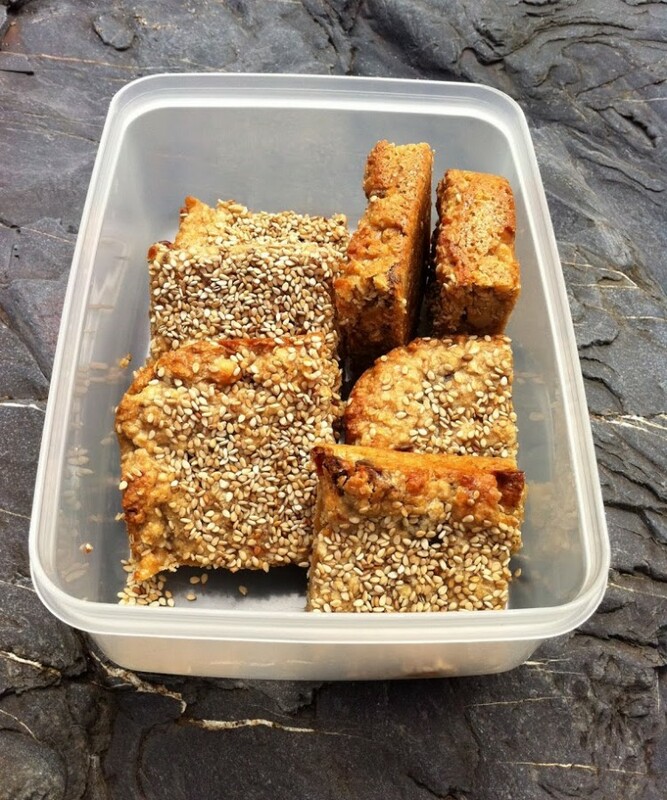 Quite honestly, the flapjacks I made before I left were not really needed, but they did come in useful on the long boat trips to and from Scilly and allayed any possible hunger pangs that arose during the day whilst we were out walking. I think we’ve come back two stone heavier than when we left. Melted 125g unsalted butter in a large pan with a heaped tbsp of Cornish runny honey. Stirred in 75g demerara sugar. Stirred in 280g rolled oats. Added 50g chopped dried figs, 50g chopped almonds and 25g dark 70% chocolate chips. Pressed into a 9 x7 inch tin and scattered with sesame seeds. Baked at 180C for 20 minutes. Allowed to cool, then cut into 12 rectangles. 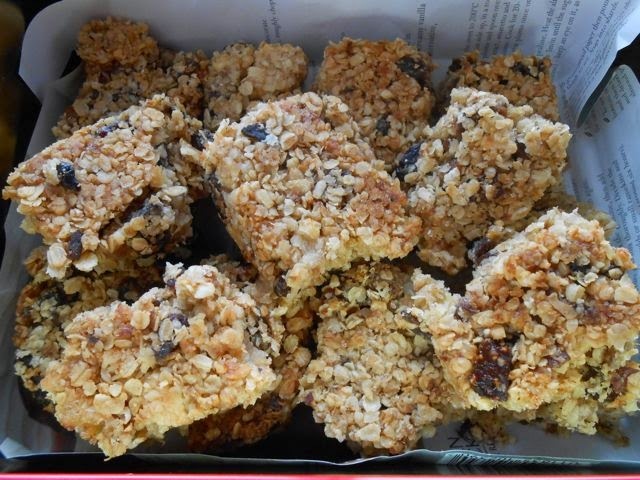 For other flapjack inspiration using chocolate, take a peek some of the other flapjacks I’ve made. Laura from How to Cook Good Food has wisely chosen figs as this month’s One Ingredient, an excellent challenge that she co-hosts with Working London Mummy. I do like figs. Homemade by Fleur is doing a flapjack challenge, so I couldn’t resist entering these figgy delights, even though it is a little late in the day (11/10/12). I’ve seen various recipes for using banana in flapjacks over the years, but keep forgetting to try it myself. When I saw this recipe over at Jam and Clotted Cream last week, I bookmarked it immediately. I had two old bananas left over from the banana and peanut butter cake that were in dire need of using up and sadly, for a Jubiliee weekend, we had no cakes, bakes or other goodies in the house. Time to try out some banana flapjacks! Mashed 2 bananas in a large bowl. Stirred in 60g soft brown sugar. Stirred in 50g desiccated coconut. Mixed in butter mixture until all incorporated. Stirred in 300g rolled oats. Pressed into a 9″ square silicone mould and sprinkled with sesame seeds. Baked for 20 minutes at 180C. Left to cool then cut into 16 squares. These smelt gorgeous whilst cooking and were very tasty to eat – not too sweet and not too bananary (if such a word exists). Banana and coconut are a well matched pair and the tropical flavourwas really good. They were just how I like flapjacks to be, crisp on the outside and chewy in the middle. I am submitting this to Bookmarked Recipes run by Jac of Tinned Tomatoes and started by Ruth of Ruth’s Kitchen Experiments. As well as the apricot curd chocolate sandwich cake I made to take to work, I also needed something suitable for a vegan colleague to eat. I ummed and I ahhed and then ran out of time so I needed something fast. Flapjacks fitted the bill. To make them a bit more special, I decided to top them with a chocolate coconut ganache, the idea for which I got from Lifescape and which recipe I based these on. I’ve never made flapjacks without butter before, so I was interested to see how they would turn out. My biggest problem here was trying to find a margarine that didn’t have trans-fats in it. As for the question of palm oil, I just had to throw my hands up on that one – sorry orang utans. If the ingredient says vegetable oil, you can bet your bottom dollar this means palm oil. In this case it actually owned up to having palm oil in the ingredients, but it was that or nothing – the trials of trying to buy ethically. Melted 175g of vegan margarine with 2 tbsp golden syrup. Stirred in 180g rolled oats, 80g desiccated coconut and a pinch of rock salt. Pressed into a 9″ square mould and baked for 18 minutes at 180C. Left to cool in the mould. Melted 100g 70% dark chocolate with 2 tbsp of coconut milk. Stirred until smooth then spread over the cooled flapjack. When set, cut into 16 pieces. Thankfully, these proved to be popular. The coconut gave a rich moistness to them and the chocolate topping worked really well. To my palate, the margarine gave an authentic shop bought taste (I think I’ll stick to butter) but they were still good. I’m now wondering what they would have been like made with oil instead of margarine – will have to try that next time. Before we got to tuck into the matcha cake of my previous post, we had the enviable task of spending a few hours having fun on a mostly deserted Cornish beach. Despite being a local lass, I had never been to this beach before so it was a particularly exciting adventure. Down the long, winding and sometimes steep cliff path we went, with no sight of the beach or the group of friends we were there to meet. Was this beach a piece of fiction made up to give us an added adventure? The views were fantastic though and CT was botanising and enjoying the coastal flora. At last, around a corner, we spotted a hidden gem – a large and virtually empty beach. Apparently when the tide is in, there is no beach, but our more knowledgeable friends had timed our visit for maximum benefit. Despite the threat of rain, we remained dry and for a couple of hours we even enjoyed blue skies and sunshine. As we don’t get to have picnics on special beaches very often, I thought something other than my normal work rye sourdough sandwiches was called for. So I pulled out the stops and made some milk bread rolls, inspired by Joanna of Zeb Bakes but actually using Andrew Whitley’s recipe in Bread Matters. But what for pudding? Something for all to share, but something that was not too heavy to carry and would travel well. I didn’t wonder for too long. I’d recently seen Dan’s wonderful recipe for Halva Flapjacks, first on Suelle’s blog Mainly Baking and then on Foodycat. It appealed straight away and I reckoned would be just perfect for a beach party. The theory is that using tahini means the butter content of normal flapjacks can be reduced. Well this maybe so, but I don’t think anyone could kid themselves these were healthy snacks. Even less so with my adaptation to include white chocolate! Melted 100g of unsalted butter with 50g brown sugar and 200g condensed milk in a large pan. Took off the heat and added 50g chopped white chocolate and left to melt. Added 75g tahini and 50g honey and stirred until all incorporated. Stirred in 100g chopped dates, 100g chopped walnuts and 20g sesame seeds. Worked in 225g rolled oats. Packed the mixture into a 9″ square mould and scattered a few more sesame seeds over the top. Baked for 20 minutes at 180C until golden. Left to cool, then cut into 16 squares. 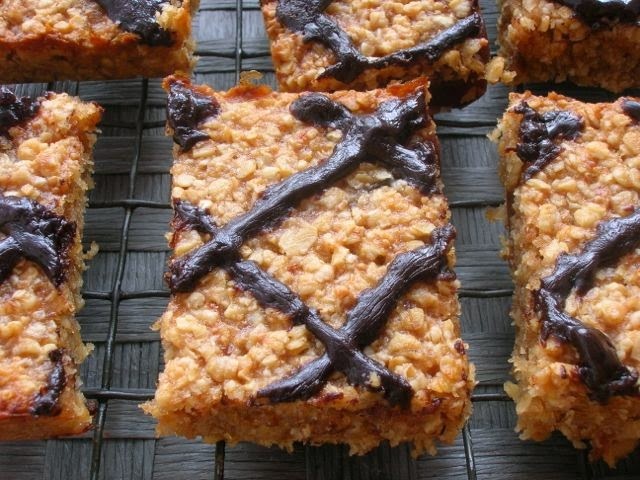 A cross between fudge and flapjacks, these were a very sweet and sticky but delicious treat. Those middle eastern flavours of dates, sesame and honey worked really well together and the nuts were plentiful giving a lovely crunch to the texture. Luckily, I remembered to take some photos before we polished them all off. The party ended with a flapjack powered Frisbee session before clambering back up the cliffs and home for tea.